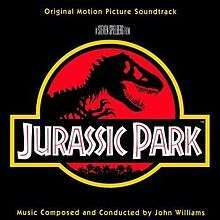 Jurassic Park: Original Motion Picture Soundtrack is the film score to the 1993 Steven Spielberg film of the same name, composed and conducted by John Williams. John Neufeld orchestrated most of the cues, while Alexander Courage entirely orchestrated three and Conrad Pope partially orchestrated two others. MCA Records released a soundtrack album for the film on May 20, 1993. Also produced by Williams, this album includes most of the film's major cues, sometimes edited together into longer tracks and often containing material that was unused in the film. Several passages are also repeated in different tracks. A 20th anniversary edition of the soundtrack was released by Geffen Records on April 9, 2013, featuring additional unreleased music. Williams began writing the Jurassic Park score at the end of February 1993, and it was conducted a month later; because Williams sustained a back injury during the scoring sessions, several cues were conducted by Artie Kane (Kane is uncredited in the film, but receives special thanks in the soundtrack album's credits). John Neufeld and Alexander Courage orchestrated the score. The composition process was done in Skywalker Ranch concurrently with the sound editing process, leading Williams to get inspiration from Gary Rydstrom's work with dinosaur noises. Williams described it as, "a rugged, noisy effort - a massive job of symphonic cartooning." He also said that, while trying to, "match the rhythmic gyrations of the dinosaurs," he ended up creating, "these kind of funny ballets". As with another Spielberg film he scored, Close Encounters of the Third Kind, Williams felt he needed to write, "pieces that would convey a sense of 'awe' and fascination," given that the movie dealt with the, "overwhelming happiness and excitement," that would emerge from seeing live dinosaurs. In turn, more suspenseful scenes, such as the Tyrannosaurus rex attack, earned frightening themes. For the first time, Spielberg was unable to attend the recording sessions for one of his own movies, as he was in Poland filming Schindler's List. Instead, Williams gave Spielberg demo tapes with piano versions of the main themes prior to his travel, and the director would listen to them daily on the way to the sets. The score uses a large orchestra that often includes a variety of percussion, two harps, baritone horns, and choir. Some passages also call for unusual woodwinds, such as shakuhachi and E♭ piccolo oboe. Furthermore, Williams included synthesizers in much of the score. Some cues, such as "Dennis Steals the Embryos", feature them prominently, but many of the synth passages are mixed much more quietly, often doubling the woodwinds or helping flesh out the lower harmonies. Several prominent celeste solos (such as in "Remembering Petticoat Lane") are also performed on synthesizers. Two major melodic ideas can be heard in this score. The first motif, which is heard most frequently, is known simply as "Theme from Jurassic Park", and is introduced when the visitors first see the Brachiosaurus. It features, "gentle religioso cantilena lines," which Williams declared was an attempt, "to capture the awesome beauty and sublimity of the dinosaurs in nature." This theme is widely regarded as one of John Williams' greatest. There are a couple different variants of "Theme from Jurassic Park." One is an extended version, heard in "Welcome to Jurassic Park." The second is a shorter, more tender version heard in various parts of the film. It revolves around a softer version of the theme's climax. This softer version was slightly modified and used for the track "A Tree for My Bed." Another theme, "Journey to the Island", takes the form of a noble fanfare. It is first heard as the helicopter approaches Isla Nublar. The composer described it as an, "adventure theme, high-spirited and brassy, thrilling and upbeat musically." The original version of "Journey to the Island" also consists of "Theme from Jurassic Park." Variations of "Theme from Jurassic Park" and "Journey to the Island" are used for the score's quieter, more tender moments, typically with woodwinds, horns, or keyboards. Williams stated that these leitmotifs were reused in order to make the pieces become an overarching theme for the park itself, "which could be used in several different places, and when orchestrated differently, could convey the beauty of what they were seeing at first." A third theme was also composed and is very different from the main two. Comprising four menacing notes, it is heard frequently in scenes involving the threat of the carnivorous dinosaurs - the raptors in particular. The cue "Into the Kitchen" (entitled "The Raptor Attack" on the original soundtrack) explores this motif extensively. The motif drew inspiration from Williams' previous suspense music, such as the Jaws theme, and utilized, "wild orchestral and choral things; the idea was to shake the floor and scare everybody." This theme also features the ending of "Journey to the Island" as its finale. Williams described it as, "operatic in a dramatic way," and an opportunity for him to emphasize the, "swashbuckling aspects of the orchestra". Note: The track "End Credits" is an excerpt from "Welcome to Jurassic Park," the film's actual end credits music. For the 20th anniversary of the film's release, the score was re-released digitally on April 9, 2013. This re-release included four bonus tracks personally selected by John Williams. Only two minutes of music from the film now remain unreleased as isolated audio. ↑ Shay, Don; Duncan, Jody (1993). The Making of Jurassic Park: An Adventure 65 Million Years in the Making. Boxtree Limited. p. 144–6. ISBN 1-85283-774-8. ↑ Thomas, David (September 1997). "John Williams Interview". Total Film (8): 74–79. 1 2 Dyer, Richard (May 9, 1993). "The Williams Whirlwind'". The Boston Globe. p. B1.